299 Stone Creek Drive, Hull, GA.| MLS# 965348 | Athens. Athens Realtor. Athens Georgia Realtor. Athens Homes for Sale. Athens Georgia Real Estate. Athens Area Real Estate. Athens Real Estate. Moving to Athens. New home Athens. Beautiful, spacious home all on one level with split bedroom plan. 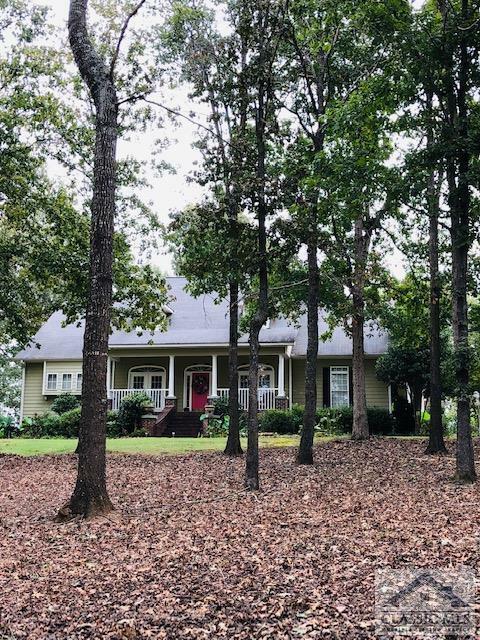 Perfect setting nestled within hardwood trees which provide shade and privacy on 2 acres with luscious pasture as a view. Open floor plan includes great room with 10 ' ceilings and gas fireplace and screened in porch. Kitchen with solid surface coluntertops has a nice sized brfeakfast room with lovely pastural views. lots of storage space! French doors to office with built-in bookcases and French doors to patio also in Dining Room with beautiful molding. Master is large with sitting area and door to screened porch. Private ensuite bath with Jacuzzi and very large master closet. Two additional bedrooms with a shared bathroom. The perfect floorplan for a great price. Home warranty included. $3, 000 carpet or paint allowance.